It was a bright sunny morning, November 12, 2011, complete with a fresh layer of snow during Bow season. How often do we get a blessing of snow to aid us in our hunting? I had started the morning in one of our many ladder stands on a farm we have permission to hunt. I saw absolutly nothing! So, I had a great urge to make a move across the road near where my Wife was in her stand. There was several unharvested cornfields nearby that I wanted to check for bear sign, as we had seen sign in that area just days before. I had also missed a big buck there too. I walked one row in from the edge in one of the cornfields next to a grassy goldenrod feild. The wind was blowing hard that day and the corn field was noisy, so it masked my noise as I walked through. Half way down the cornfield I saw antlers sticking up above the goldenrod just ten feet away. I went to draw and had a cornstalk laying across my arrow, so I flicked it off the arrow and drew the bow undetected by the buck. He was focused on a hot doe and two other bucks (that I was unaware of) so I was able to draw on him. I stretched as high as I could to shoot over the goldenrod and with out using my sights, shot him at four yards. He ran 50 yards before expiring. 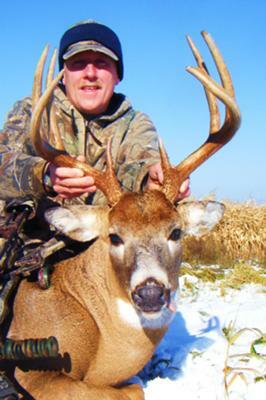 The buck was an 8-point with a gross score of 125-1 and ended up as a net score of 123-6. The same big buck I had shot at days before! Later that evening the excitment wasn't over. I had a chance to throw an arrow at a bear and missed twice. It still was a super day, Thank You Lord!